VMYG members have access to a large archive of plans and 'how to do it' material from the mid 19th century onwards.. The plans on the website have been subjected to various print and computer processess over the years and considerable care needs to be taken if you intend to build from them. Ideally they should be redrawn full size and faired off carefully. Dimensions are not to be scaled. In particular note that vertical and horizontal axes may have been resized differently in software processing. "The Model Mechanic", "Model Maker" and "Model Boats" were the titles of successive magazines with a model boat content published continuously from May 1946 to date. The same publisher also published "Aeromodeller" magazine. There was, and is, also a plans service, called for many years "The Aeromodeller and Model Maker/Model Boats Plans Service". Each new plan added to the range was announced in the magazine by an article accompanied by a small-scale reproduction of the plan. The range included a considerable number of model yacht plans. There were many racing class yachts by the foremost designers of the day, and cruising and scale yachts. Many of the older and so now-less-popular plans have been transfered to The X-List (see below). However, for those plans currently available from the publishers of "Model Boats" magazine, go to www.modelboats.co.uk . Click on SHOP, click on VISIT NOW, click on MODEL BOATS, click on PLANS, click on YACHT. The X-List contains all the older plans from "The Aeromodeller and Model Maker/Model Boats Plans Service". There are no photos on the X-List website, the plans are identified only by their catalogue number and name. Boat plans have the catalogue number pre-fix MM. Therefore it is neccessary to have a copy of "The Aeromodeller and Model Maker Plans Service Handbook" for the 1960s or 1970s. Copies are often for sale on Ebay. However the Master Copies of the plans on the X-List are currently stored in a warehouse in Peterborough, and copies of these plans and the list it self are not currently available. The following link, is to a list, prepared by one of our members, of all the sailboat and sailboat related plans published in Model Mechanic, Model Maker and Model Boats magazines between 1946 and 1980 inclusive. Do not confuse it with the X-List mentioned above. Both "Model Boats" magazine and The X-List are now owned by MyHobbyStore Ltd., Enterprise House, Enterprise Way,Edenbridge, Kent TN8 6HF Tel 01689 869840. This is part of MyTimeMedia. Our President, Russell Potts has information as far back as the 1860s. This is particularly useful in trying to identify the design to which a yacht is built and in reviewing a range of possibilities when choosing a design to which to build a modern replica. Russell also has a number of unpublished plans from various sources including a collection of Turner drawings from the 1920s. 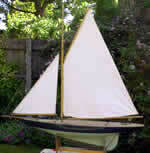 The magazine "Marine Modeller International" has the following vintage model yacht plans available. "Pocohontas", a 1936 Marblehead designed by WJ Daniels. Ref. MAR 2489. "Skylark", a 1938 Braine-steered 36R designed by FC Tansley. Ref. MAR 2735. Braine and vane steering gears. Ref. MAR 2863. A reprint of articles on vane gear. In three parts - large pdf download. An article by Russell Potts. We hope to expand this section and invite other contributions. This section gives tips for design and construction problems particularly affecting more traditionally designed craft. A larger scale scan of this is available to members only. Prospero designed 1912 WJ Daniels. Published in Model Sailing Yachts 1951. Note- this is an external link - use your browser back button to return here.